I may not be best pleased with all the rain we have had of late, coupled with a lack of sunshine, but there are always areas of the garden that adore these conditions. For the first time ever I have had an amazing crop of lettuce, mainly due to the fact that it is not relying on me to water it everyday. I also planted them this year in the raised bed that does not get full sun, so on those days when the sun is blazing hot they are no longer being scorched. The dwarf broad beans seem to love this slightly shaded bed too. The raised beds are a great success and make gardening so much easier on the knees! Looking at them in the photos they look crammed with vegetables, and of course they are. But look closely and you will also see I have potatoes growing in bags in between them, saves me all that digging. If I am talking about Great Garden Moments I can not stop myself from giving the Peony that flowered in the last few weeks a mention. It's never flowered in the last four years, but last year it was moved when the 'L' shaped flower bed was replanted. Behold this year it flowered, a truly Great Garden Moment, it had just the one bloom flower, but how magnificent. It may take time and patience to create these Great Garden Moments, but it's worth remembering to stop, sit down and also enjoy them. So if the sun is out it's a glass of Pimms, if the rain clouds are rolling in its a cup of tea. The veggies in your raised bed are looking really good and healthy! Some of my veggies have done really well with all the rain, though I have lost a few to the snails in places, which is a shame. Very pretty peony bloom, it sounds like it is very happy in it's new home. 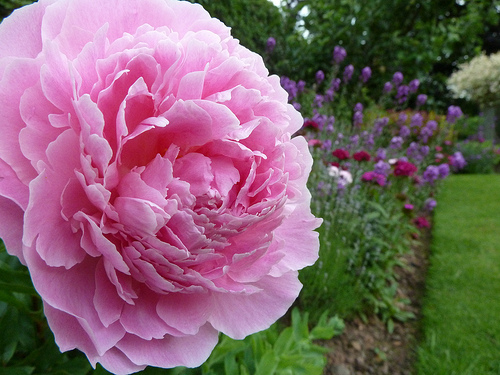 One of my peonies was the same, didn't bloom for a few years, then when I moved it the next year it flowered. Your raised beds are lovely. Nothing is more satisfying than growing your own fruits and veg. Right now we are enjoying the first strawberries from our tiny strawberry bed. In a few days I will know if there will be enough berries to make jam. I am always amazed at Nature's generosity. Happy Gardening and thanks for letting us visit your garden. Thanks for your kind words Debs, the raised beds are one of my favourite things in the garden. Been a great year for strawberries for me too. Thanks so much Karen, all this rain certainly has keep most things very healthy.